Opening hours: Banks and offices are open Monday-Friday 9:15am–4:30pm, and closed on Saturday and Sunday. Post offices are open Monday-Saturday 8:30am-5pm, and closed on the first Saturday of each month and Sundays. Large shopping malls and department stores are daily open from 10am till 9 or 10pm. 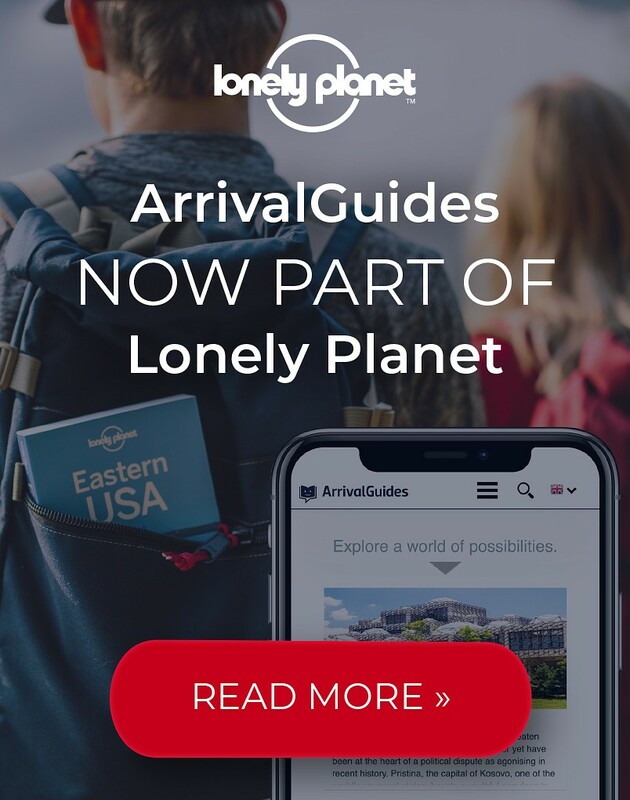 The city’s landmarks range from the colonial-era Fort Cornwallis and the 60-foot Clock Tower on the waterfront Esplanade to the mighty Komtar Tower, and Georgetown has a fabulous choice of places to eat, drink and shop. Batu Feringhi, northwest of Georgetown, was Malaysia’s first international resort area, and with fine sand, accommodation to suit all budgets, nightlife, watersports and good shopping, it remains one of the region’s most popular and best-equipped beach destinations. Penang Bridge, the island’s road link to the mainland, was completed in 1988 – stretching 13.5 km (8.5 miles) from Gelugor on Penang to Seberang Prai in Malaysia, it is the longest bridge in South East Asia, and it is currently claimed to be the third longest bridge in the world. Batu Feringghi is Penang’s main resort area, where a long strip of hotels, restaurants, bars and shops has grown up along the island's best beach. This is where most visitors end up staying, as Batu Feringghi has a choice of accommodation from cheap and cheerful guesthouses to five-star luxury hotels. 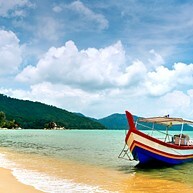 The resort area also has a wide choice of watersports, including water skiing, windsurfing, parascending and scuba diving. 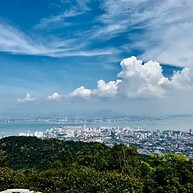 For a superb view over Penang and the Straits, take the funicular railway to the top of Bukit Bendera hill. The ride takes 30 minutes and the summit, 830 m (2,727 ft.) above sea level, is, with an average temperature of 3 degrees Celsius, cooler than the steamy coast. Dozens of venomous pit vipers slither and coil among the urns, roof beams and potted trees within this bizarre Chinese temple, built in 1850, and sacred to the deity Chro Soo Kong. The snakes – regarded as benevolent spirits – are seen as guardians of the temple. Hundreds of palms, tropical trees, shrubs, ferns, orchids and other flowering plants grace the 30 hectares of grounds, glasshouses, ponds and nurseries at the Botanical Gardens. A popular picnic spot for local families, as well as for tourists stopping by for having a break from sightseeing. Penang’s famous butterfly farm at Entopia Natureland is the world’s largest. 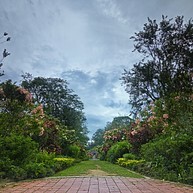 With garden pavilions and breeding areas for more than 50 species of spectacularly colourful butterflies and insects, which all the same share this ecological space with a variety of other animal species such as invertebrates and small reptiles, up to 4,000 gorgeous living specimens can be seen at any time. Claimed as the largest Buddhist temple complex in southeast Asia, Kek Lok Si – the Temple of Paradise – is marked by the Ten Thousand Buddha Pagoda and a statue of Kuan Yin, the Goddess of Mercy. A newer temple to the Goddess was built in 2001-2002. Monkey Beach, known as Teluk Dyung and popular for its calm water, fine sand, picnic tables and troop of half-tame macaques, is an attractive destination for a 2-3 hour walk through the tropical woodland of the Penang National Park, Taman Negara Pulau Penang. Check-in at park office before setting off. 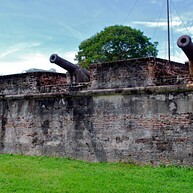 Fort Cornwallis is Georgetown’s most prominent historical landmark. Its star-shaped 18th-century ramparts on the waterfront enclose an array of British colonial buildings including prison cells, a powder magazine and chapel and harbour beacon, and bronze cannons are still mounted on the battlements. 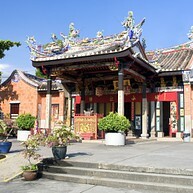 Kuan Yin, the Goddess of Mercy Temple, was built during the 19th century by Chinese settlers of Hokkien descent. 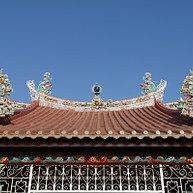 It is the oldest Chinese temple in Georgetown, named in honour of a devout Buddhist sage. 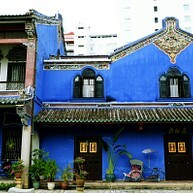 Cheong Fatt Tze, the Blue Mansion, was one of the wealthiest merchants of the 19th century, and Penang Straits Settlement imported artisans from China to build this opulent 38-room mansion. With its five courtyards, carved woodwork, Gothic louvered windows and cast iron, the mansion is a fascinating fusion of East and West culture. 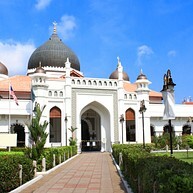 The building was restored at a cost of 7.6 million ringgit, and it is crammed with sculptures, antique furniture and tapestries, while now being a unique boutique hotel. 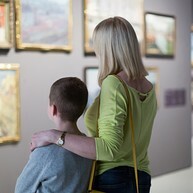 However, it is also open for non-residents during guided tours, so book one ahead. Khoo Kongsi was built just over a century ago, and it is the finest example of a Hokkien Chinese ‘clan house’ complex in Georgetown. 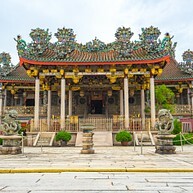 Its grand hall is replete with decorative carvings and ornamented columns, and the red tiled roof is crowned with extravagant carvings of demons, dragons and other creatures from Chinese mythology. The hall is surrounded by a complex of shops, houses and other buildings, within a rectangle of defensive walls. The dazzlingly colourful Sri Mariamman Temple is the cultural and religious hub of Georgetown’s ‘Little India’ quarter, home to immigrants from the sub-continent for more than a century. Encrusted with garishly painted statues of deities, demons and mythical creatures, the Sri Mariamman is the oldest of the city’s Hindu temples, and it is still in daily use. Within stands a valuable statue of the Hindu deity Lord Subramaniam, lavishly embellished with gold and precious stones. A statue of Captain Francis Light, the English adventurer who founded the Penang Straits Settlement (later: Georgetown), here presides over a collection of maps, prints, photographs, paintings, traditional costumes and antiques. Muslim Indian sepoys (soldiers) of the British East India Company’s Penang garrison built this mosque, Masjid Kapitan Keling, in 1801, and it has been extensively restored and expanded in the two centuries since. Above the yellow domes and turrets of the mosque compound, a tall minaret is towering.